Senior forward Justin Fuglestad (19) hustles in on the fore-check. Two old TVL rivals met on the ice at Pirelli Arena in Franklin on Saturday afternoon as the Medfield High boys varsity hockey team hosted Westwood. Thanks to some stellar goaltending on both ends by Medfield’s Mason Matthew and Westwood’s Ben Goodrich, the teams were able to garner a point apiece with the game ending in a 1-1 tie. Following an extremely physical and defensive-minded first period by both sides, the game remained scoreless until 3:21 to play in the second period when Westwood’s Nick Horsfall rang one off the pipe from the slot, but followed his shot to the front of the net and tapped home the rebound on his backhand. The tally put the Wolverines (4-1-3) ahead, 1-0. Mike Vachon, Mike Tyer, Aidan Parker, Jack Lyons, and James Wilder come together in celebration following Medfield’s game-tying goal in the third period. Goodrich was phenomenal down the stretch of the second period, padding away a pair of quality scoring chances by the Warriors (5-0-2) to keep the game 1-0 in favor of Westwood after two periods. Medfield upped its intensity and peppered the Westwood net with shots throughout the third period, but Goodrich stood tall and preserved the lead with a big glove save with just under seven minutes remaining. Finally, with 5:34 to play, Mike Vachon broke through for Medfield by tipping a shot from the point by Aidan Parker to knot the game at one. One of the strengths of this Medfield team throughout the first half of this 2018-2019 season has been its penalty kill, and with a little under two minutes to play, the Warriors penalty killers were put to the task when Jim Cosolito went off for boarding. The Medfield PK did its job, blocking away a swarm of shots and clearing the puck periodically to preserve the 1-1 tie and remain unbeaten on the season. 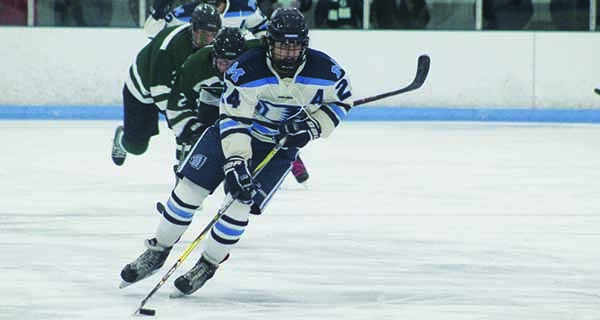 Medfield forward Mike Tyer (24) makes a cut in rushes the puck through the neutral zone. Medfield will travel to face Norwood on January 19 for their first-ever TVL meeting with the Mustangs. It will also mark the first of two times the teams will meet this season after Medfield knocked Norwood out of last year’s Division II State Tournament. Westwood, meanwhile, will take on Ashland that same night.